I didn’t read this book, but I’m bilingual and I can say from experience: yes, you do feel different speaking different languages. The difference is subtle though. You see, different languages have different metaphors, different cultural connotations. Some parallel words (always translated one into another) have slightly different meanings, so while speaking you adjust you perspective. It’s not simply translating word for word, it’s conveying the same meaning that’s important. That’s why literary translation is considered an art. It takes talent to switch your world view from one language to another and bring your vision to the readers in another tongue. I tried – and it was a fascinating project of mine, although I can’t judge how successful; that’s for readers to decide. I loved working on translations but I have to admit: the hardest to translate was poetry – emotion in verbal form – which brings us back to the topic of this book. How to make the readers see the same emotional wave in a different tongue, while staying true to the original’s words, is the hardest challenge of any translator. There is that too, but I think the difference really is subtle. I think feeling different might really be mostly a feeling, not an actual change anywhere in your brain’s architecture, except as a result of contextual issues. I mean, there’s a word in Welsh, “hiraeth”, that is close to untranslatable (into English, at least). There are ways you can convey the meaning, but they tend to be long-winded. I’m not a Welsh speaker, but I have always felt the emotion of hiraeth and understood immediately when given the word for it. So it’s not the language itself that makes that difference between me and an English person, who doesn’t find it easy to grasp the concept (not impossible, but not easy), it’s the whole context. I almost feel like I have to resort to poetry to explain what hiraeth means! But probably I should shut up and listen on the subject, since I’m not bilingual! I agree about the difficulties of translation, though: working on Old English and Old Norse translations taught me that. You’re right. The concepts are sometimes impossible to translate – that’s what I meant when I talked about cultural perceptions. People speaking different languages definitely see the world differently – a little bit. Maybe not even a different world but from a different angle. 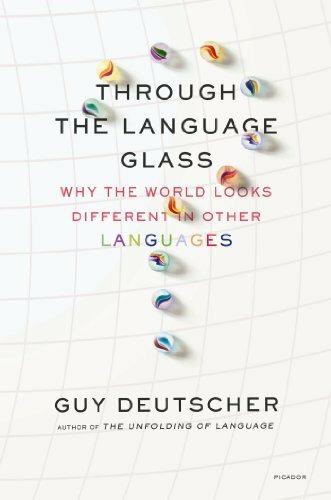 I like the idea of a different angle — Guy Deutscher mentions that the thing that differentiates languages most is not the concepts and so on you can share, but those that you have to. For example, in English, you can say “I spent the night with a friend”, without having to clarify whether that was a friend of the same or opposite gender. In French, you have to specify (and as a non-fluent speaker, even, I feel that it’s normal that you have to specify in French). So it changes the things that have to be left to assumption, changes the way we communicate (if not the way we actually see the world) not just because of the sound of the words but because of the information we convey by default.